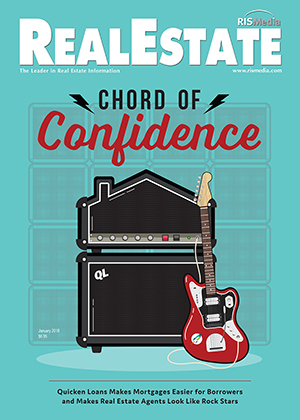 Editor’s Note: What follows is the cover story in the January issue of RISMedia’s Real Estate magazine. Real estate moves fast, and how quickly you respond to prospective clients can make or break your chances of getting their business. Mortgage lenders, on the other hand, have a captive audience and don’t always feel the same urgency. At Quicken Loans, though, that’s not the case. Emails and phone calls are answered quickly, typically within minutes. And it’s not just borrowers who are viewed as clients; real estate agents also play an integral part in the online lender’s mortgage process. On one hand, it’s no secret that the mortgage industry has been slow to adopt technology into its rigid systems and underwriting processes. On the other hand, Quicken Loans has continually broken new ground and riffed on its own successes by building consumer- and agent-friendly portals and services that remove guesswork from the equation. Today, Quicken Loans is the largest online mortgage lender and the second-largest retail mortgage lender in the United States, according to Inside Mortgage Finance. And while the company has racked up an enviable collection of accolades for consumer satisfaction over the years, real estate agents also have rave reviews about the company—and for good reason. To make the mortgage process better for consumers, Quicken Loans executives turned their attention to working hand-in-hand with real estate agents, their most powerful ally, says Tom Dempsey, divisional vice president of Business Development with Quicken Loans. The centerpiece of this effort: MyQL Agent Insight, a custom back-end platform that increases loan visibility by letting agents see exactly where their client stands in the loan approval process. From a smartphone or desktop, agents can see what documents might be missing, when an appraisal comes in, and when a loan is cleared to close or even denied. It’s worth noting that Quicken Loans’ mortgage clients must give consent for their agents to see updates on their loan file and, if they do, personal or financial information is never revealed to agents, Dempsey adds. The accessibility and transparency MyQL Agent Insight brings to the process reduces a lot of the uncertainty agents experience in most transactions, Dempsey points out. “It always comes back to connectedness in our industry,” Dempsey says. “The ability for a lender and a real estate agent to deepen relationships and create a higher level of trust, in turn, helps all of us to better educate and serve consumers. What exactly makes Quicken Loans different from its competitors? It starts with the company’s culture of service and the many “ISMs,” or ideals, the company strives to work and live by, Dempsey says. “The ISMs are less about what we do and more about who we are,” adds Dempsey. 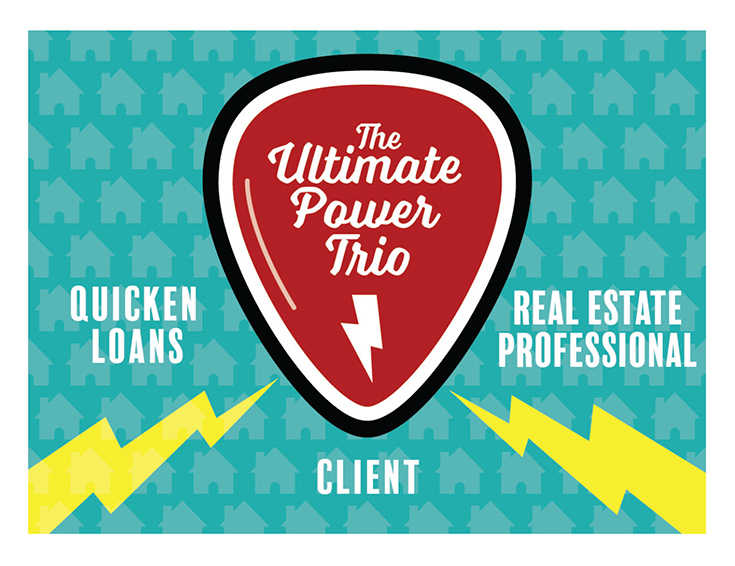 In addition to the mortgage banker and other professionals handling loans, there’s a dedicated team of Quicken Loans team members who focus solely on providing end-to-end communications support to agents. Real estate professionals can get answers to any and all questions they have about loan options, business partnerships, transaction processes, and more. 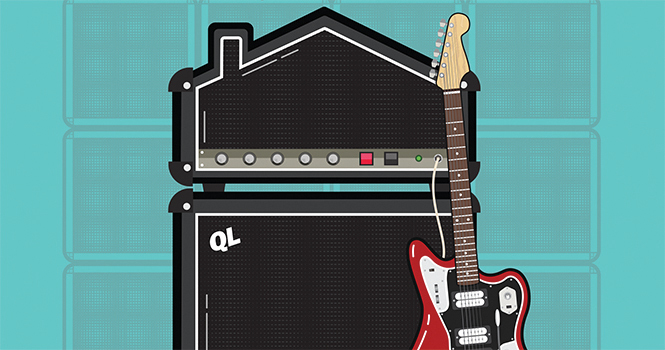 Quicken Loans’ market managers allow the online lender to be visible in agents’ communities. The in-person education, support and insights these team members provide help localize its efforts, Dempsey says. Leveraging technology for a number of tasks helps Quicken Loans’ mortgage bankers and other team members focus on what they do best: setting (and exceeding) expectations, says Max Wegner, vice president of Communications and Client Experience with Quicken Loans. In fact, setting expectations at the beginning of each transaction is another key competitive advantage Quicken Loans is proud of. “If everyone—lender, borrower and agent—is on the same page regarding who’s doing what and when, we all win together,” Wegner says. 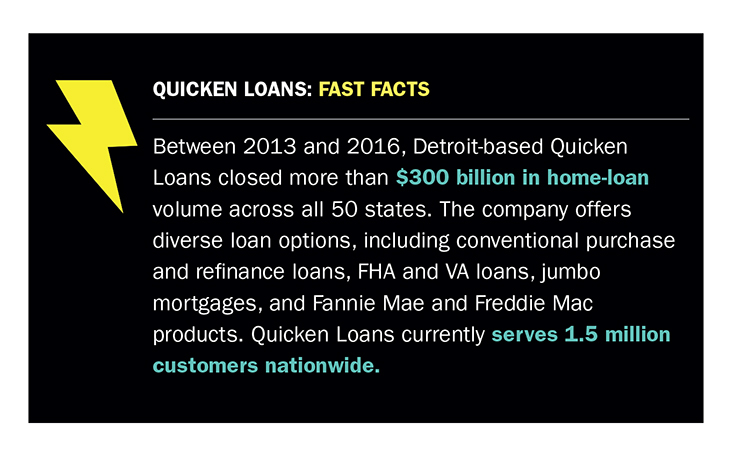 Quicken Loans has evolved in its 33-year history as a direct lender. Today, the company services virtually all of the loans it originates, Wegner says. But becoming a “lender for life” required Quicken Loans’ leadership to take a hard look at its loan application process. Homebuyers know that the process comes with a lengthy documentation pile and deep digging into their financial background. With recent regulations, application requirements are more rigorous than ever before. To ease that pain for consumers, Quicken Loans launched Rocket Mortgage, the first fully online, on-demand loan application process. It allows borrowers to get fully approved, underwritten and closed—all without ever speaking to a mortgage banker, unless they want to, Wegner says. In its first full year of operation, Rocket Mortgage funded more than $7 billion of the record $96 billion in total closed loan volume in 2016 for Quicken Loans. Rocket Mortgage clients have gone from application to closing in as little as eight days on refinance loans, and 16 days on the purchase side, according to internal data. In contrast, the industry’s average closing time on new purchase loans is about 45 days. Rocket Mortgage, both the app and its web counterpart, is used to manage a client’s loan from application all the way through to making payments. This includes viewing the application status, making one-time or recurring payments, asking questions about the loan, checking out how payments are broken down into principal, interest and escrow, and more, giving clients full transparency into their loan. Jason Mitchell is a superstar agent with sales numbers that other real estate agents dream about. President of the Jason Mitchell Group at My Home Group Real Estate in Scottsdale, Ariz., Mitchell has closed more than 900 transactions and over $215 million in sales volume since 2012. More than 65 percent of that business came from clients who used Quicken Loans, Mitchell says. He credits the company’s fast closing times and constant communication with enabling him to make good on his promises to clients. “When I call anyone at Quicken Loans, I get a call back within the hour; they don’t drop the ball on accountability,” Mitchell says. “Your typical independent loan officer or broker operates their own business their way. 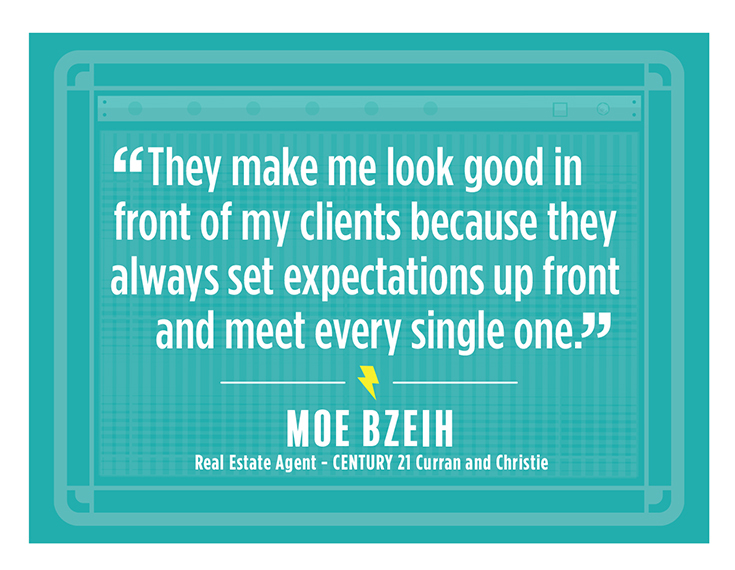 For real estate agent Moe Bzeih, accountability is just one of the ways Quicken Loans makes him look like a rock star to his clients. In his diverse Dearborn, Mich., market, Bzeih works with clients who speak English, Spanish, Russian, Arabic and Portuguese. He was floored to learn that Quicken Loans had more than a few mortgage bankers who speak these languages—and others, too. Bzeih, an agent at CENTURY 21 Curran and Christie, has only been in real estate for three years and says his business really took off this past year thanks to Quicken Loans referrals. Roughly a quarter of the 75 total transactions he expected to close in 2017 were with buyers getting a mortgage through Quicken Loans, he says. But his commissions are secondary to his main mission: making clients happy. In one instance, Bzeih says he had a client who woke him up, eager to get a jump on a property that hit the market late at night. By the next morning, the client made an offer and her loan approval got underway with Quicken Loans. However, the property appraisal came in much lower than expected, and the client didn’t have the extra $3,500 to cover the difference, Bzeih recalls. So, he offered to take it out of his commission, viewing the move as an investment in future business—and in his client’s satisfaction. What happened next stunned Bzeih. Above all, Bzeih says that Quicken Loans’ mortgage bankers bring an unexpected—and welcome—human element to an otherwise automated process, setting them apart from other lenders in the space. 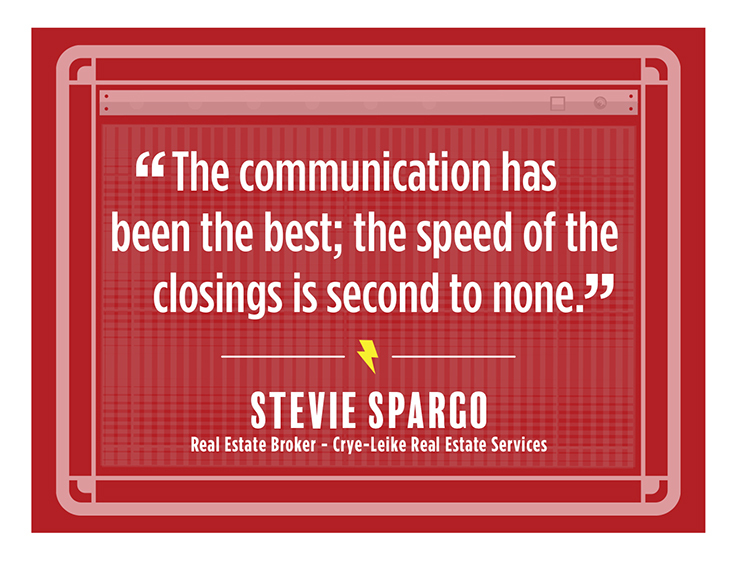 Ownership of the communications with agents is just one of the many things Stevie Spargo loves about the lender. But Spargo, a broker with Crye-Leike Real Estate Services in Hot Springs, Ark., wasn’t immediately sold on doing business with an online-only lender. Frankly, she was downright skeptical of the idea. But when a Quicken Loans representative came to her brokerage to talk about the company’s loan options and technology, she decided to give it a shot. She’s glad she did. In 2017, she closed 10 transactions with clients who used Quicken Loans. The positive experience has changed her perception of online lenders for the better, she says. “The communication has been the best, and the speed of the closings is second to none,” Spargo says. Spargo says her clients rave about the transparency of their Rocket Mortgage accounts and being able to check on the status of their loan, day or night, and track its progress. Also, many of her clients received a $500 cash-back offer after closing, plus a $750 closing credit from Quicken Loans as part of a special “Mortgage Insiders” program. With 2018 underway, Quicken Loans isn’t resting on its laurels. In fact, the lender is looking to enhance its relationships with real estate professionals even more by integrating other aspects of a transaction into its cutting-edge technology, Wegner says. For example, the company is looking at several ways to incorporate services, such as online document signing and transaction-management systems into its mortgage experience. Another area of focus for Quicken Loans this year? Allowing agents to upload addendums to purchase contracts into the MyQL Agent Insight self-service portal. This functionality will streamline paperwork when changes need to be made to a contract after an inspection or appraisal, Dempsey says. Quicken Loans will continue to fine-tune its mortgage process this year in an effort to “help consumers mortgage confidently.” But what the lender really wants is for more agents to see and experience what both the Rocket Mortgage process and account can do, Wegner says. Helping borrowers navigate one of life’s largest financial transactions is a great responsibility, and it’s a service the mortgage bankers take seriously, Dempsey says. It all comes back to building relationships. “A seasoned homebuyer may require a different level of connectedness versus a first-time buyer,” Dempsey says. “We believe that setting expectations with clients at the beginning is key, and we invite clients to be as much a part of the lending process as they want to be. Have clients who don’t have pristine credit? Quicken Loans offers QL Credit, a free counseling service for clients who are denied a mortgage pre-approval because of credit issues. A dedicated credit repair expert will work with clients for 12 – 24 months to help fix credit issues—and help them increase their chances of acing their next mortgage application. For more information, please visit www.RocketMortgage.com. *For J.D. Power award information, visit www.jdpower.com.